Situated in the town of Knysna, to many considered the heart of the Garden Route. 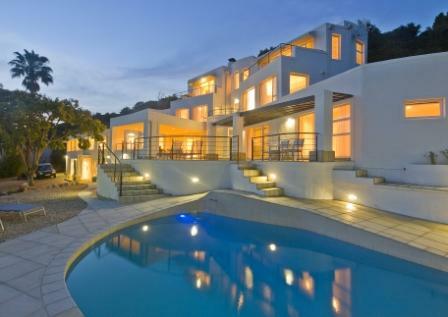 Villa Afrikana is perched high above the town, on a hill fittingly called �Paradise" overlooking the world renown Knysna Heads and surrounding lagoon. With its summery, gleaming white, the geometric architecture of Villa Afrikana is already quite a sight. The stylish interior is just as defined in the same perfect white. A modern, unpretentious interior gives the compact Villa Afrikana a surprisingly open feel to its rooms. Look out for the eye-catching artworks and cleverly placed objects. 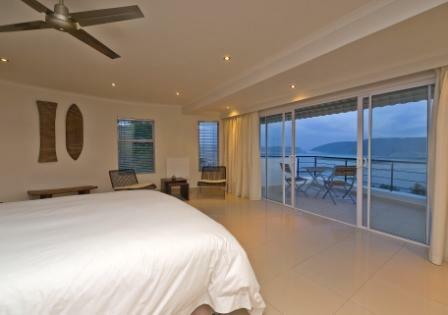 The attractive style encompasses a total of 6 suites in this 5* Guest House / Bed & Breakfast on the Garden Route. 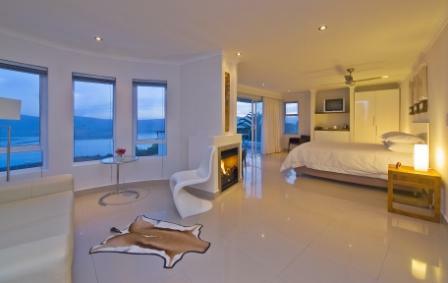 The suites are wonderfully roomy and all have a fantastic view over the lagoon of Knsyna. Each also features a comfortably furnished and also very spacious luxury bathroom in cutting design with floor heating and double washbasin. Depending on which suite you choose, you�ll be sleeping in a comfortable queen size or even king size double beds, all fitted with quality bedclothes and feather comforters and pillows. All suites of this Guest House / Bed & Breakfast have a TV with DVD as well as tea and coffee makers. 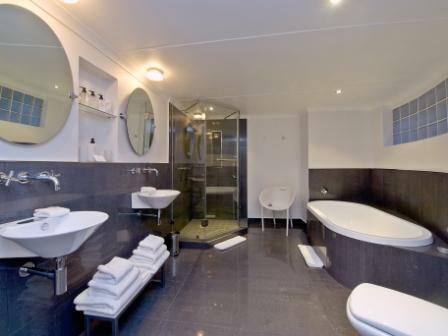 To add, some suites hold further surprises such as a hydro massage tub and a private balcony/terrace for instance. Personalized Bathroom Amenities, Hair Dryers, Bathrobes and Electronic Safes are also provided for each suite for your enjoyment and comfort. 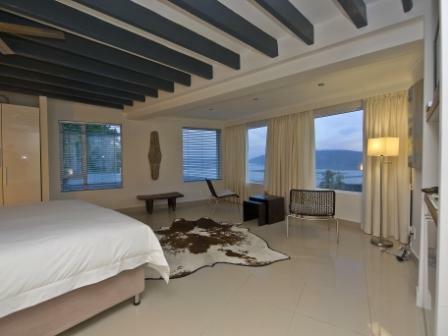 The suites are wonderfully roomy and all have a fantastic view over the lagoon of Knsyna. Each also features a comfortably furnished and also very spacious luxury bathroom in cutting design with floor heating and double washbasin. Depending on which suite you choose, you�ll be sleeping in a comfortable queen size or even king size double beds, all fitted with quality bedclothes and feather comforters and pillows. All suites of this Guest House / Bed & Breakfast have a TV with DVD as well as tea and coffee makers. To add, some suites hold further surprises such as a hydro massage tub and a private balcony/terrace for instance. Personalized Bathroom Amenities, Hair Dryers, Bathrobes and Electronic Safes are also provided for each suite for your enjoyment and comfort. The Knysna region covers a total surface area of 1 059 km². The town is situated mainly along the northern shores of the Knysna Lagoon, while the region is bordered by the Outeniqua Mountains and the Indian Ocean. The region's flora includes Afro-montane, or temperate rainforest, which covers the hilly terrain. An abundance of unique Cape Fynbos (�fine or delicate bush�) grows throughout the region. The climate in Knysna is generally temperate and pleasant throughout the year. Whatever the season, Knysna stays green. Rain falls mostly at night, frost is rare and light snow falls only on the mountain peaks - and only once or twice a year. Summer is warm to hot during the day, wear light clothing, a hat and a wide-spectrum sun-block during the day whilst a light sweater may be required at night. Winter is generally warm during the day and cool to cold at night, wear layers of clothing which are easily removed during the day and a warm coat at night. 50% deposit of the entire stay is requested to confirm reservation and balance at the end of the stay. From George: On the N2 turn left into Fletcher Road after the first traffic light by the Total Garage, turn left again at the top of Fletcher Road and then right into Circular Drive (second road on the right), Watsonia Drive is on your right at the top of Circular Drive, we are located at number 13. From Port Elizabeth: On the N2 drive through until the end of town, turn right into Fletcher Road by the Total Garage, turn left again at the top of Fletcher Road and then right into Circular Drive (second road on the right), Watsonia Drive is on your right at the top of Circular Drive, we are located at number 13.